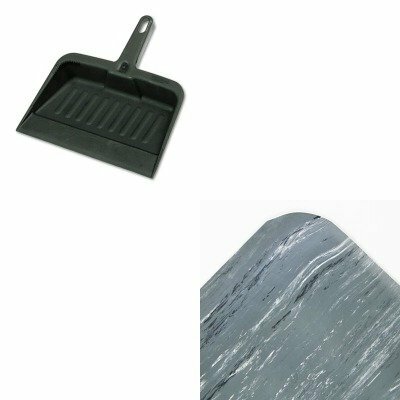 lt;stronggt;CWNCU3660GYlt;/stronggt;lt;BR/gt;French Gray Vinyl Spiffy Cushion Step Mat, 3' x 5'lt;BR/gt;When the job calls for spending a lot of time on your feet, it helps if you're on a comfortable surface. The marbleized rubber top fused to thick sponge foam helps relieve some of the discomfort of standing for extended periods of time. Features beveled edges and rounded corners to keep mat flat and help avoid dangerous falls. Mat Type: Anti-Fatigue Mat Application: Indoor Materials: Rubber.lt;BR/gt;lt;BR/gt;lt;stronggt;RCP2005CHAlt;/stronggt;lt;BR/gt;French Gray Vinyl Spiffy Cushion Step Mat, 3' x 5'lt;BR/gt;Handy dustpan features a tapered front edge to help simplify sweeping-up. Heavy-duty, moderately flexible plastic provides commercial-grade durability. Lanyard handle-hole allows you to hang and store the pan out of the way. Material(s): Polypropylene; Width: 8 1/4quot;. ~ Includes one dustpan.